We’d love your help. Let us know what’s wrong with this preview of That's Amore by Marion Ueckermann. Begin your journey to Tuscany this summer with Book 1 of A Tuscan Legacy! Each novella is a complete and satisfying romance, filled with faith, family, forgiveness and love. After deciding to take a six-month sabbatical, Italian lawyer Rafaele R Begin your journey to Tuscany this summer with Book 1 of A Tuscan Legacy! Each novella is a complete and satisfying romance, filled with faith, family, forgiveness and love. To ask other readers questions about That's Amore, please sign up. This book made me feel that I had personally visited the beautiful Tuscan Valley, tasted the delicious food, and learned some of the language. Well-developed and intriguing characters who struggle with guilt, mistakes that rob them of their joy as well as their loved ones, and the emptiness of missing a father’s love & involvement in one’s life. That’s Amore is the perfect start to this series, with a mystery that will make the reader anxious to read the next book and discover more. Marion has captured in this beautifully written story the true beauty and love of what I’ve always imagined Italy would be. Falling in love in Tuscany, Rafaele and Jayne’s story will captivate your senses! After meeting for the first time just for a few hours and never seeing each other for few years after, can love at first site really be real? Can a British girl and Italian guy capture each other’s heart? A well crafted Italian love story with a romantic Tuscan setting, diverse characters, and mysterious paintings. Just like a firefly is a light shining in the darkness, Rafaele finds God’s and Jayne’s love in the darkness. That’s Amore! That's Amore by Marion Ueckermann is a delightful contemporary Christian romance. It is the first book in the A Tuscan Legacy series that is a multi-author nine book series that has started so full of promise. With wonderful descriptive passages, the Tuscan countryside really comes to life in glorious 3D. I could 'see' the landscape and almost 'feel' the heat. Once again Marion Ueckermann has drawn fully rounded and likable characters that weave their way into the readers hearts. A big fan of all That's Amore by Marion Ueckermann is a delightful contemporary Christian romance. It is the first book in the A Tuscan Legacy series that is a multi-author nine book series that has started so full of promise. Once again Marion Ueckermann has drawn fully rounded and likable characters that weave their way into the readers hearts. A big fan of all Marion Ueckermann's books, I was delighted to see some familiar faces. It felt like I was catching up with old friends. The novel revolves around family. A family with a whole missing generation as grandchildren meet to celebrate their grandmother's eightieth. The reader can 'feel' the love radiating out. However there are family secrets. Secrets that continue to wield power. Secrets can burden people down. Confession is good for the soul. There is the theme of forgiveness. If we do not dispense forgiveness, we can easily become bitter. If we feel it is too hard to forgive, we must ask God for help but we must forgive. Fear can hold us back. We may fear repeating the sins of the fathers but we are all unique and not destined to tread the same path. There is a mystery to be solved. The reader wonders at the outcome. That's Amore is wrapped up with satisfaction for the reader with a feel-good ending to leave you smiling. A beautiful summer romance in Tuscany! Firstly, let me say how much I enjoyed writing Sienna’s story (Solo Tu, Book 7) for A Tuscan Legacy. Marion Ueckermann and Autumn Macarthur have created a rich and compelling story world for the series. The family mystery is introduced in That's Amore: That's Love (Book 1) and threaded through the nine books in the series. The resolution to the family mystery is revealed in Book 9 – La Risposta: The Answer. That’s Amore is a short novel length book that featur A beautiful summer romance in Tuscany! 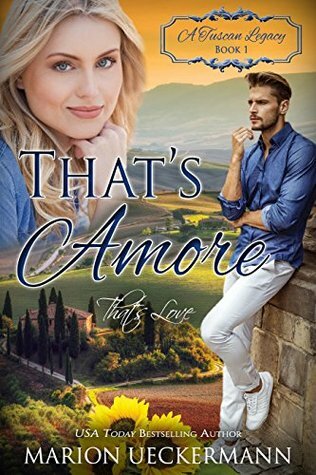 That’s Amore is a short novel length book that features Rafaele and Jayne’s romance, and introduces the series mystery plot that unfolds in the shorter novellas. The Italian book titles are named after songs. Rafaele and Jayne dance together to the song That’s Amore: That’s Love in their story. The song is important to Rafaele and Jayne because they danced to That’s Amore when they first met at a wedding two years earlier. For the other novellas in the series, the song titles may not play a role in the actual story. All nine books include a fully developed contemporary Christian romance. The series spans three continents and has a strong international flavour. Cultural differences are explored in the stories. More conservative readers may be concerned to see Rafaele and Nonna drinking vino (wine) at dinner as part of their normal life in That’s Amore. Villa Rossi is a typical Tuscan Estate that includes a vineyard. Drinking a glass of vino at dinner in Tuscany is a normal part of their culture – in the same way that abstaining from alcohol is normal for some Christians in other cultures. It would have been culturally inaccurate to not include vino in That’s Amore. Rafaele’s siblings and cousins drink sparkling water instead of vino at Nonna’s 80th Birthday Party. I loved reading That’s Amore and seeing my girl, Sienna, with her family in Tuscany for Nonna’s 80th Birthday Party. Rafaele Rossi is a lawyer who returns to Villa Rossi to help his Nonna. His father passed away three months earlier and, as the eldest son, it’s his family duty to take care of the family estate. A family duty he’d avoided due to his complicated relationship with his late father. Jayne Austin remembers the one night she spent dancing with Rafaele at a friend’s Tuscan wedding two years earlier. The English jewellery store where she works closes down, and Jayne decides to go on vacation in Tuscany. She prays that God will lead her back to Rafaele. At one point running the family farm was the last thing Rafaele wanted to do. Mainly because his father wished it. But things change when you least expect it. Something Jayne knows all too well as she sets off for Tuscany in the hope of finding someone she met once a couple of years ago. That’s Amore is set in Tuscany, in the very heart of the Rossi family. Setting the scene for the whole series, it nonetheless centres firmly on Rafaele and Jayne as they find the road to love is sometimes paved At one point running the family farm was the last thing Rafaele wanted to do. Mainly because his father wished it. But things change when you least expect it. Something Jayne knows all too well as she sets off for Tuscany in the hope of finding someone she met once a couple of years ago. That’s Amore is set in Tuscany, in the very heart of the Rossi family. Setting the scene for the whole series, it nonetheless centres firmly on Rafaele and Jayne as they find the road to love is sometimes paved with potholes. The book is set in the wonderful landscape of Tuscany,Italy. Here Isabella organize her 80th birthday at Rossi estate. reading the book, you can image the big villa with many rooms, flower garden and field, thanks to the author. Oh I love this new series of books. Well, at least I love the first book in the series! And, I can't wait for each of the other books to be released! I'm part Italian and this book had me wanting to research my heritage. I LOVED all the imagines and flavors of this book. It really brought Italy and all the family traditions to life. Marion Ueckermann did a fantastic job of making everything so real and enjoyable. I LOVED the twist of a bit of suspense this book has and it a appears like that theme will be carried throughout the whole series. How exciting! If you enjoy good clean stories and LOVE Italian life and flair, you'll love this book. I also really appreciated how this author presented her characters with issues. Yet, only through the strength, mercy, and love of God could they find healing. The first book in this series is a wonderful start to a look into the lives and romances of several cousins with roots in Tuscany. Mommy's 80th birthday reveals several family secrets, including a unknown cousin. In this book, the romance of Rafaele is the focus. Two years previously he had danced the night away at his best friend's wedding with a lovely Brit. Now she is back in Italy and the sparks of romance are relit. Will they find true love? This was such a pleasant read that truly made me use the Italian English dictionary! WOW such a learning experience and I declare I was not ready for it to end. I would definitely recommend this book to all women walking in the same circle but desiring a husband. Jayne gave a lesson in working while you wait on God that young women must embrace. Love may just be miles away but you will never know until you do like the character Jayne....Go. What a fun start to a series. It definitely has me intrigued. The scenery is amazing. Rafaele and Jayne have a very interesting beginning and second chance at love. I know with God all things are possible and He directs our paths, but things seemed a little too easy most of the time for this couple. I liked them, but definitely felt this was more a fairy tale. I thoroughly enjoyed this first in the Tuscan Legacy series. Well written. Caught my attention from the first paragraph and I just couldn't read it fast enough to find out what was going to happen. The characters are certainly engaging. Definitely looking forward to the rest of this series. Highly recommend. Outstanding book! A big family with secrets that are coming out, mysterious paintings are arriving and and two people reconnect to find their happily ever after. Enjoyed the story and loved the characters. The mystery was never explained, I hope it continues in the rest of the series. I absolutely love this entire series, and this book is one of the best! I love the crossover of a grown up Michael from Faith Restored! I enjoyed this first book in the Tuscan Legacy series. Since I've read other of Ueckermann's books, it was fun to notice some connections with them. I look forward to reading more in the series. It was a fairly good book until I ran into something I didn't care for and I stopped reading. That was around the 80% mark. This is a very enjoyable and sweet family romance with a big Italian family and a lot of romance,love,and laughter too. "For you know the plans I have for you" declares the Lord, "plans to go prosper you and not harm you, plans to give you a good life and a future" is the ongoing theme throughout this well crafted story. Isabella,her grandchildren and their stories will be shown in this nine book series. I loved the romance of Rafaele and Jayne,the twists and turns of the story that won't be resolved until the end of the series. MARION UECKERMANN's passion for writing was sparked when she moved to Ireland with her family. Her love of travel has influenced her contemporary inspirational romances set in novel places. Marion and her husband again live in South Africa, but with two gorgeous grandsons hanging their hats at the house next door, their empty nest’s no longer so empty. Visit Marion at her website, www.marionueckerm MARION UECKERMANN's passion for writing was sparked when she moved to Ireland with her family. Her love of travel has influenced her contemporary inspirational romances set in novel places. Marion and her husband again live in South Africa, but with two gorgeous grandsons hanging their hats at the house next door, their empty nest’s no longer so empty.